What are top trends in European retail for 2019? Learn how to utilize the IDC Retail Use Cases to update IT roadmaps from Leslie Hand, Vice President, IDC Retail Insights. This IDC Retail Insights presentation summarizes our recent research on how shoppers sized up their 2017 holiday shopping experience and the recommendations we developed for customer experience (CX) strategies for the 2018 holiday shopping season. Here's the challenge: beyond its reach into 10's of millions of households, catalog, and CX technologies Amazon's hold on shoppers' wallets and shopping carts runs deep, as a leader in satisfying gift givers' emotional needs — engendering joy in finding the right gift and confidence in being treated fairly and squarely. This research points to a number of strategies for outflanking shoppers' emotional connection to Amazon. Top performers engendering joy employ quite different business strategies to reach shoppers in these emotional dimensions. Amazon offers massive breadth and depth, TJX and Ross Stores win with the treasure hunt for deals, Nordstrom succeeds with service and curated assortments, and Best Buy offers well-curated assortments and well-trained associates. The future of retail became clear in 2017; it isn't a destination, it is in fact a journey and that means adaptability, scalability, and experimentation are core tenets of viable platforms for the future and a priority in 2018. Retail organizations must orchestrate "best" engagement scenarios for consumers while optimizing productivity of assets, inventory, and employees so that growth and profitability can be maintained. This presentation draws insights from IDC's CloudView Survey and IDC Retail Insights' ongoing research with retail vendors, users, and service providers to understand the cloud trends impacting the retail industry — cloud adoption, and what is driving increasing adoption; cloud maturity in the retail industry; hybrid cloud; the shifting workloads between public and private cloud; cloud KPIs; and the continuing concerns that is hindering greater adoption of the cloud by retailers. •What will happen in the adoption of the retail omni-channel commerce platform? •How will Western European retailers embrace a customer experience architecture? •What is the impact that external events will have on European retail industry? •What will be the main differences, across countries, in terms of business priorities and investment plans? We invite you to join us for this IDC Retail Insights Webinar on 25 January, 2018 at 2 PM (GMT) led by Ivano Ortis, Vice President IDC Retail Insights. During the webinar, Ivano Ortis will share insights on the future of commerce, and in a panel discussion, Luciana Padua, Director of Consumer Insights in Digital Brand Commerce at Adidas Group, and IDC’s Andrea Sangalli will share their vision on the current state of retail industry. 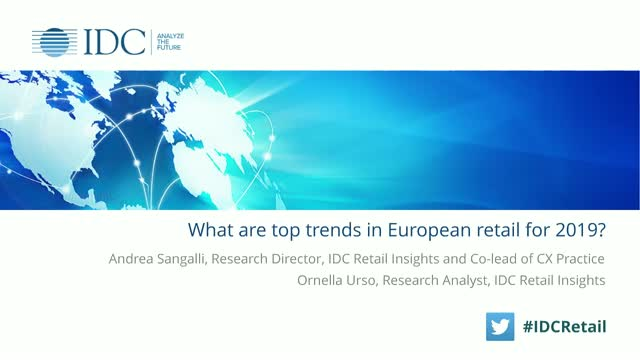 Title: What are top trends in European retail for 2019?